In 2017, Google released new functionality for personal Gmail users and business G Suite users that addresses this issue. A range of spreadsheet cells can be copied from a Google Sheet and pasted into a document as a table. The table in the document can be linked to the spreadsheet (the default option). 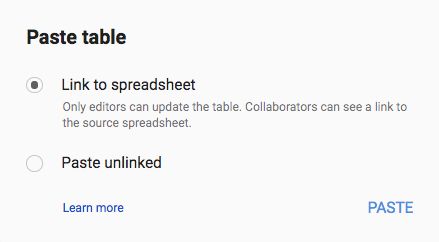 When the spreadsheet is updated, the table in the document can be updated with the click of a button. Here’s a video that explains how this works. Any formatting changes made in the Google Sheet can be updated in the doc with the a push of the Update button. However, the converse is not true. The pricing table in the document can be unlinked from the spreadsheet if needed. Once the proposal is ready to be sent to the customer or prospect, it can be saved as a PDF and then emailed.